Do you wake up with a million things on your to-do list? Forget to bring things with you? Learn how to stay organized at home with these practical tips. I’d wake up with a million things on my to-do list: Pay the car insurance and write the rent check. Remind my son to put his homework folder in his backpack. Sign up for a parent-teacher conference time slot. 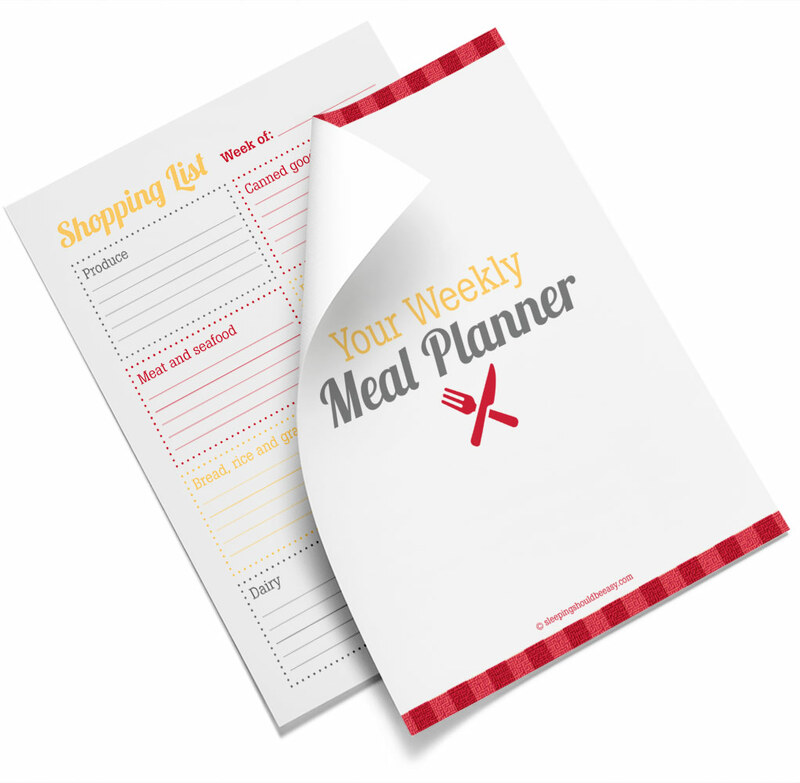 Carve out time to find recipes and write a shopping list. Buy gifts. Paper towels. Oh, and we were low on salt. Everything can feel like a game of catching up with too many things going on. This doesn’t even count big picture tasks like saving for an emergency fund and potty training the twins. The other day, I brought the wrong lunch and packed my son’s pizza instead. I forgot my phone, and I couldn’t find my shoes. We all have those days when we feel frazzled and disorganized. Think you’re just not the organized type. Don’t cast yourself as not cut out. Or that you’re stuck this way, because you’re not. Rely on your memory. Our heads can only take so much. Put your tasks into a “collecting” system, which we’ll get into more later. Think you’ll get it together once XYZ is finished. Don’t wait until something happens before you get your act together. Do you try to remember all the things you need to buy at the grocery store? Do you rely on memory to track your calendar? Every time you need to do or remember something, tuck it away in a few reliable collecting systems. This can be your phone’s to-do list, a calendar, or paper and pen (I use an Erin Condren Life Planner). Maybe it’s your inbox or a notebook to collect your ideas. One of the easiest ways to remove tasks and bills from your to-do list is to set them on automatic. Don’t try to remember to pay your car insurance or transfer money for preschool tuition. Automate your finances so they happen without you needing to do anything. Another trick is to use your phone’s calendar to set reminders. For instance, I need to swap my contact lenses every two weeks. Even if I write it down on the calendar, I forget to check my calendar, and many times I’ve lost track of when I need to swap. Now, my calendar notifies me so I don’t even have to check the calendar. Setting calendar reminders is also useful for regular school tasks. Stuff like packing your child’s library book every Tuesday. Bringing diapers to day care every Monday. Packing their show and tell items on Fridays. For Thanksgiving, I assumed correctly that my kids would be out of school Thursday and Friday. What I didn’t know was that my eldest would be out on Wednesday, too. Talk about scrambling for time off. Now my husband and I know better. We printed both schools’ calendars and tacked it to our wall, marking any days we need to pay attention to. Decide how many meals you want to cook for the week (I choose six). Then pick one day of the week to find those recipes and write a shopping list. I use Saturdays to gather the six recipes I plan to cook for the week. I also write my shopping list that time. Come Sunday mornings, I’m ready to shop for groceries. Our apartment was built in the 1960s and has the obligatory wet bar that’s never used. In our creativity (or laziness), it’s become our “in-box.” Mail, important bills, book fair forms, papers to sign… these make their way to the bar. My husband and I know that anything on the bar needs attention. We clear the bar once we pay the bill or sign the homework. Create a space in your home for your in-box. Yours may be more sophisticated than our wet bar, maybe something like an actual in-box. Or maybe it’s your desk, or the entry way table. Designate a place for important items to go, and clear the area once you’ve taken care of it. Not only do chore lists make sure your house stays clean, it also keeps things fair. No one person is doing everything. Make a list of chores that fall between daily upkeep and deep cleaning. I don’t write ‘wash dishes’ on the chore list because that’s a daily maintenance. But we make sure to clean the tub, mop the floor and dust the surfaces. Does a massive chore list or cleaning day make you shudder? Consider cleaning as you go. Talk yourself into doing something right away instead of putting it off. If you’re like me, you’ve had to make an emergency run when you realized you’re down to your last diaper. I’ve learned better. Now I do a simple inventory of our supplies. Write a list, or just glance into your storage room or cabinet. See which items you’re low on, and which you have enough until the next shopping trip. And if you see you are low on something, write it down on your collecting system so you don’t forget to buy it next time. All this advice might seem overwhelming. I know if I saw a list of these things, I wouldn’t know where to start. Here’s a handy trick I learned about habits: Start small. Seriously. Like, so small it would seem like a no-brainer. Keep doing that for four to eight weeks until you’ve developed a habit you don’t even have to think about. It’s become as habitual as brushing your teeth or adjusting your rear view mirror when you get in the car. Once you’ve mastered that habit, move on to the next one. The beauty of starting in small increments is that one habit builds off of the next one. You’re transforming your lifestyle instead of checking things off. Otherwise, too many goals get overwhelming and, unfortunately, forgotten. Think about your goals and your biggest pain points and start chipping away at them using these tips. 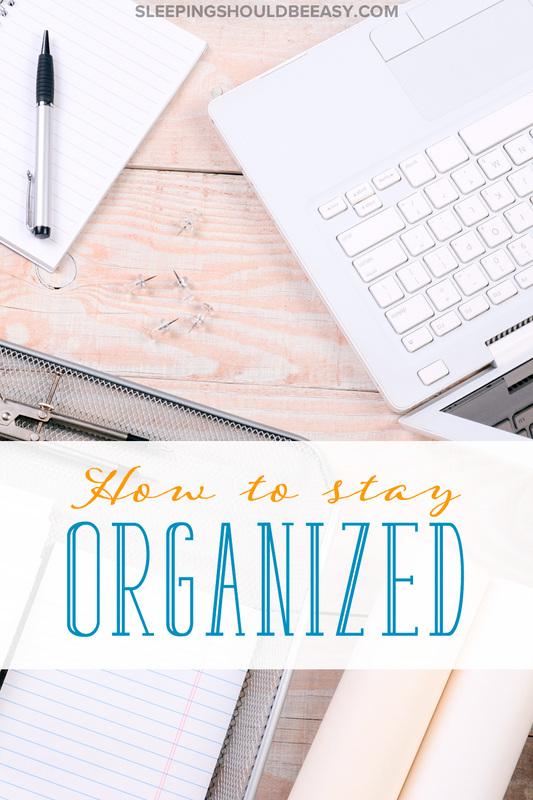 Tell me in the comments: How do you stay organized? What are you most disorganized about? The calendar print-out of Scarlet’s school idea is brilliant! I so often forget half days, delayed openings or holidays. It’s not good! I used to think I could keep everything in my head, but I’m learning lately that I can’t at all. Yup I’m the same Tamara. I used to rely on assumptions like, “Oh, they’re probably out for two weeks” type of guessing. The calendar really helps! Oh, man. Our oldest was out for Wednesday before Thanksgiving, too. Thankfully the teachers email weekly notifications and that was in bold for the entire month of November. I also had the foresight to take time at the beginning of the school year and enter all of the school’s important days for the entire year into Google Calendar, inviting the Husband as an attendee to each one. That has been a lifesaver so many times. We’re still working on getting the kids and the Husband to hang coats right when getting home…it’s a work in progress! Ooh I like that you put all their school stuff on your Google calendar, and including your husband, too! Smart. I’ll do that too! No need for paper reference in that case. So many great ideas here! I always printed out school calendars and put one on the bulletin board and kept one in my planner. (Yes, I still use a paper planner and I still love it!) I also keep lists on my phone for various retailers (e.g. Staples, Walmart..) so I’m ready in case I get a small window of time. I love paper planners too Seana! Though I mostly use it for blogging, but I can’t imagine going completely digital. I just switched from all digital to part-digital plus a Plum Paper planner. What a difference! There’s something about pen to paper that helps me remember things, plus laying out the week gets me thinking about how best to use open space that week. I’ve automated a lot, but I do go over my set-and-forget bills every 3 months. There have been errors so it’s good to check in! I’m working on keeping the dishes under control this year. I’ve had it empty before dinner so the kids can add their dishes after dinner. Then I add it the last few things and set it to run after I’ve gone to bed. 8 days in and so far, so good! I love that resolution, Rabia! Dishes can get so insane. I especially hate it when I come home to a pile of BREAKFAST dishes haha. You are a genius!! These are awesome tips!! I have the monthly calendar for the kiddos on my fridge, and just as an extra measure I have days marked on my dry erase board, too. This year, 2016, I’m hoping to become a better planner. I’ve already begun using my planner, I just need to setup a better schedule. We totally need an inbox.